More than 50 years of scholarly attention to the intersection of language and education have resulted in a rich body of literature on the role of vernacular language varieties in the classroom. This field of work can be bewildering in its size and variety, drawing as it does on the diverse methods, theories, and research paradigms of fields such as sociolinguistics, applied linguistics, psychology, and education. 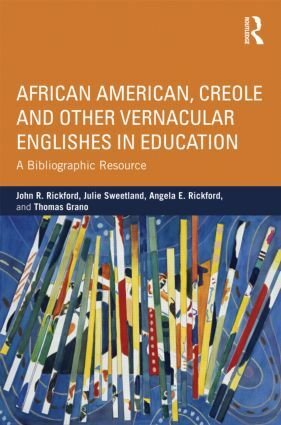 Compiling most of the publications from the past half century that deal with this critical topic, this volume includes more than 1600 references (books, articles in journals or books, and web-accessible dissertations and other works) on education in relation to African American Vernacular English [AAVE], English-based pidgins and creoles, Latina/o English, Native American English, and other English vernaculars such as Appalachian English in the United States and Aboriginal English in Australia), with accompanying abstracts for approximately a third of them. This comprehensive bibliography provides a tool useful for those interested in the complex issue of how knowledge about language variation can be used to more effectively teach students who speak a nonstandard or stigmatized language variety. John R. Rickford is the J.E. Wallace Sterling Professor of Linguistics and the Humanities and Pritzker University Fellow in Undergraduate Education at Stanford University, USA. Julie Sweetland is Academic Director of the Urban Teacher Academy at the Center for Urban Education, University of the District of Columbia, and Lecturer in Linguistics at Georgetown University, USA. Angela E. Rickford is Professor of Education at San Jose State University, USA. Thomas Grano is a Ph.D. candidate in the Department of Linguistics at The University of Chicago, USA. The NCTE-Routledge Research Series, copublished by the National Council of Teachers of English and Routledge, focuses on literacy studies in P-12 classroom and related contexts. Volumes in this series are invited publications or publications submitted in response to a call for manuscripts. They are primarily authored or co-authored works which are theoretically significant and broadly relevant to the P-12 literacy community. The series may also include occasional landmark compendiums of research. The scope of the series includes qualitative and quantitative methodologies; a range of perspectives and approaches (e.g., sociocultural, cognitive, feminist, linguistic, pedagogical, critical, historical, anthropological); and research on diverse populations, contexts (e.g., classrooms, school systems, families, communities), and forms of literacy (e.g., print, electronic, popular media).